Owning a home is a good excuse to build up your toolbox, but do you know what tools are essential? AHS lists the tools that make most basic home repairs easier. Whether you just purchased your first home or you’ve owned a home for many years, you can never do without a basic set of high-quality tools. You never know when you might need to perform some routine maintenance or make an emergency repair. But what should a homeowner’s toolkit include, and under what circumstances do these specific tools come in handy? Here’s our list of the tools we bet you’ll be reaching for over and over again. From hanging pictures to knocking together furniture, hammers are true workhorses. In fact, depending on your home’s size, age and other specifications, you may want to stock your toolkit with more than just the classic, all-purpose claw hammer. Rubber mallets (great for tamping down carpet or pounding anything you’d dare not dent) and sledgehammers (for certain outdoor jobs) are good supplements for your basic toolkit. Whatever the hammer, always look for a head whose weight feels appropriate — neither too heavy nor too light — and a handle that feels both comfortable and unlikely to snap or shatter. Whether you are trying to decide where that new couch should go or are heavily involved in construction, a tape measure is one indispensable tool. Models that can measure at least 14 feet are best. When comparison shopping, give some consideration to the durability of features, such as the measure’s tang (the hook at the end of the tape), locking mechanism and belt hook. You may be familiar with the phrase “on the bubble.” But you may be surprised at how applicable it is around the house. For example, need to add some more storage? A spirit level can help you ensure that no items start sliding off the shelves you install. Assign a high priority to levels that can help you straighten out along horizontal, vertical and diagonal axes. Anti-slip functionality that keeps the level planted just where you want it is also a plus. The jaw of an adjustable wrench can be set to any width within a fixed range. If that sounds complicated, it’s not — you spin a dial and wrench’s jaw open or close. You could opt for a range of fixed wrenches instead, but if you prefer to keep your toolbox uncluttered, an adjustable wrench is the way to go. This tool may seem somewhat specialized, but it can save your home from extensive damage. It sports a “curb stop key” which you allows to remove meter covers as well as multipurpose tools for shutting off main supply valves (gas or water) to your home. You may not use this tool often, but when you do need it, you really need it. A flashlight is your best friend when home maintenance takes you into dark places, like crawl spaces, attics and basements. Of course, a good flashlight also comes in handy should you lose electricity. In addition to your primary flashlight, consider a hand-crank or wind-up model, so you never run into the dreaded dead battery problem when you need illumination most. Once you find the model of flashlight you like best, acquire a second one to keep in your vehicle in case of a roadside emergency. Pliers extend your grasping, bending and cutting abilities. As such, pliers are a versatile hand tool that can be used on a wide array of home projects. Add a set to your toolbox, or go with basic adjustable pliers to tackle projects like fixing your garage door or replacing your toilet fill valve. Sometimes, improving your home is a matter of making, rather than fixing holes. A cordless drill equipped with bits suitable for drywall, wood, masonry and metal would be ideal, but even a standard drill set will serve most homeowners’ needs. With a collection of driver bits, your cordless drill can double as a power screwdriver. Whatever task is at hand, just remember to keep your drill fully charged. 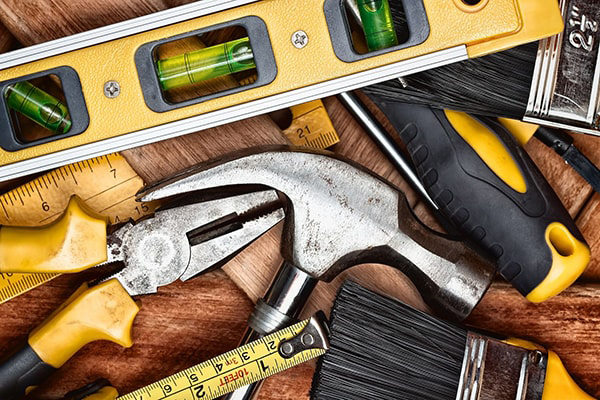 Regardless of how you choose to fill your homeowner’s toolkit there will be times when you don’t have the right tool for the job — or when the job is too much for your live-in handyman. In that case, the most valuable tool at your disposal is a home warranty policy from a reputable provider like American Home Shield.